Holland Park Villa is located in the vicinity of the prime High Street Kensington district in Central London, renowned for its upmarket shopping zone. Amcorp Properties Berhad has entered into a joint venture agreement with reputable partners Hotel Properties Ltd, UK based developers Grosvenor and Native Land, to develop this high rise, exclusive residential project estimated to be RM2.83 billion in Campden Hill. Holland Park Villa is well connected by the High Street Kensington Tube Station (Circle and District lines) and numerous bus routes. The mark that distinguishes Holland Park Villa from other residential schemes is that of its exclusive location. It overlooks Holland Park and is well within the vicinity of other well-known high end residences such as Philimore Gardens and Wycombe Square. With renowned architects John McAsian & Partners enlisted for the project, Holland Park Villa is a two acre site geared to be one of London's most internationally sought after address. 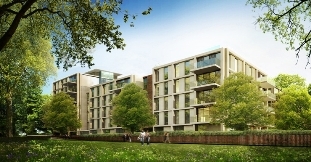 The development comprises 72 units of 1 to 6 bed private apartments with an enormous double height entrance featuring extensive landscape and courtyard gardens, dedicated concierge, 78 secured basement car park spaces and the highest specification amenities in London.